"I Left Her Behind For You"
Born Cecil Anderson in Trinidad, the Duke of Iron learned music from his famous father and others. He came to the United States and made New York City his new home in 1923. In 1940 he began playing professionally at the Village Vanguard, and after ten months he headed west, touring until a triumphant return to New York in 1943. From then on he was King of Calypso and toured college campuses for some time until returning to Trinidad. There, he formed a new band and headed to Europe for a tour. 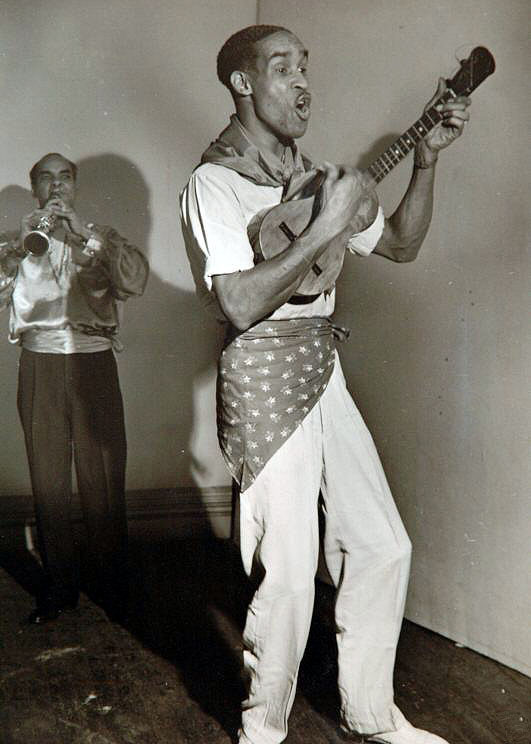 He returned to New York at the height of the calypso craze (1956, the year Belafonte's debut eclipsed Elvis') to begin a long stint as headliner of the Jamaican Room. 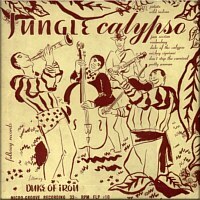 On the LP Jungle Calypso, the Duke is accompanied by Modesto Calderon (bass player), Gregory Feliz, and Victor Pacheco. The latter two take turns at drums, violin, and clarinet. By the time of his Jamaican Room engagement, the Duke was playing quattro (four-stringed guitar) with a drummer, bassist, pianist, and two others doubling on sax and clarinet. The inclusion of steel pan would have marked Limbo, Limbo, Limbo as a low point in the Duke's career but for the strong original material and excellent recording by Rudy Van Gelder. The trademark, distorted clarinet was as vital a part of the Duke's charm as his unique voice and phrasing. In case anyone could not make out the ribald lyrics --always sung very innocently, of course-- the clarinet's "dirty" tone told the story without irony. The clarinet is especially strong in the classic, swinging rocker, "The Big Bamboo," possibly the world's greatest song. "Parakeets," sung by the Duke of Iron (as well as the Talbot Brothers of Bermuda), is another of the earthy tunes for which calypsonians are notorious. 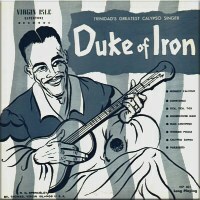 The Duke of Iron carried the true sound and many of the best calypso songs into the recording era, steadfastly refusing to modernize. The liner notes of the Calypso! LP quote the Duke as saying, "Calypso has a different rhythm all its own. It may resemble this and that at times, but it is in a class by itself where rhythm, style, and delivery is concerned. Some singers try to change Calypso but I try to keep it as it is." Thankfully, the Duke of Iron's calypso was recorded that way -- faithfully and extemporaneously. A various artists album, it features Duke Of Iron, Lord Invader, Lloyd Thomas, and Lord Kitchener. Tracks are "Woman Police", "Samson & Delilah", "Monkey Song", "Take Me Back To Trinidad", "Kitch", "Tongue Tied Mopsie", "Gotta Eat", and "Creole Chinee Party". Man Smart Woman Smarter, Music Teacher, Woman Police, Merengue Jenny, Big Bamboo, Last Train, Lost Watch, Creole Girl, Undercover Man, The Naughty Fly, Coldest Woman & Woman Love only 2 cuts reissued from the 10"
issued on 78s, 45s, and 10" LPs. The Big Bamboo, I Left Her Behind For You, Parakeets & Music Lesson reissues Calypsos Too Hot to Handle except Lloyd Thomas' "Mary Had No Little Lamb" instead of Duke of Iron's "Postman"
7" Calypsos For Adam & Eve Monogram MEP-64 Kalypso Records Ltd SIDE A: Lord Kitchener "Big Toe" & Duke of Iron "Big Bamboo. SIDE B: Sir George Brown "He Like It, She Like It" & Four Deuces, "Lemme Go Emelda"
7" Creole Girl b/w Easy Fish Monogram ??? 7" Man Centipede b/w Calypso Samba Monogram ??? 7" Man Smart b/w Medley Of Brown Skin Girl/Mary Anne Monogram ??? 7" Monkey Calypso b/w Undercover Man Monogram ?? ?